Stop giving graduates Oh, The Places You’ll Go and start giving them Solla Sollew. Hey, I get why you’d give a Dr. Seuss book as a graduation gift. It ticks all the boxes: nostalgia for childhood, lessons for the future, jubilance for the day itself. It hits the whole major chord of grace notes you want to hear on commencement day: wit, whimsy, wisdom, wistfulness. Seuss was a beloved grandfather figure, full of winks and jests for his young audience: He intertwines in one person the whole multigenerational rainbow you see in the folding chairs at a graduation ceremony. Best of all, when you give the gift of Seuss, you know the panicked job-hunting 18- or 22-year-old recipient might actually take the seven minutes required to read it. So yeah, I get why you’d turn to old Theodore Geisel on graduation day. I just don’t get why you’d pick Oh the Places You’ll Go! You could do worse, I suppose. Oh the Places is a peppy slideshow of panoramas, strung together by second-person narration reminiscent of a cloying self-help book. It’s the extended director’s cut of a better-than-average Hallmark Card. I’m not sure it would have achieved its iconic graduation-gift fame if not for the fact that its opening word is the conveniently on-the-nose “Congratulations,” punctuated with an exclamation point—one of three in the first four lines. Its relentless enthusiasm—from the triumphalist title to the frenzied cry of “KID, YOU’LL MOVE MOUNTAINS!”—is so far over the top that it threatens to be the one thing Seuss never was: inauthentic. Where, I ask, are the myriad other qualities of Seuss’ genius? Where is the absurdist wordplay of If I Ran the Circus, the wistful insight of Gertrude McFuzz? Where is the deep moralism of Horton Hatches the Egg, the unflinching darkness of The Butter Battle Book, the mournful poignancy of The Lorax? Where is the boundless imagination of McElligot’s Pool, the fearless culinary advocacy of Green Eggs and Ham, the taxonomic and zoological precision of One Fish, Two Fish, Red Fish, Blue Fish? Where is the Seuss I love? He’s there, all right. 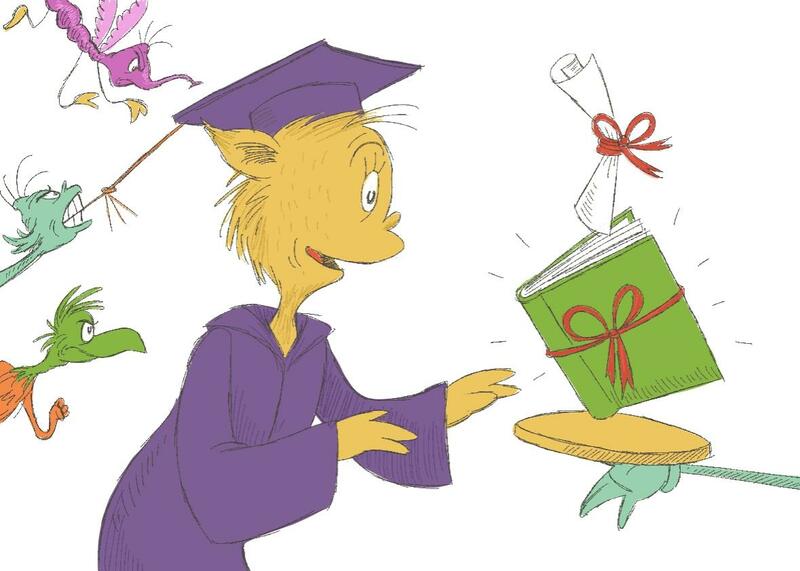 To find the real Seuss, just flip open to any page of the book we all should be giving for graduation: the overlooked masterpiece I Had Trouble in Getting to Solla Sollew. Like Oh the Places, the superior Solla Sollew tells the tale of an Odyssean journey. Like Oh the Places, it’s a Seussian coming-of-age story, a narrative of obstacles faced, challenges met, trials overcome. But it’s so much more than that. Where Oh the Places aimlessly wanders, Solla Sollew quests. Where Oh the Places pans across vacant landscapes, Solla Sollew explores the populated realms of cities and towns, a world far closer to the one we inhabit. Where Oh the Places has little more narrative thrust than a stack of postcards, Solla Sollew has all the twists and turns of a lovingly told fairy tale. But the ultimate difference lies in the message. Oh the Places has an unfortunate habit of brushing past one of adult life’s most enduring and inescapable features: struggle. (“Will you succeed? Yes, you will indeed.” Well, that was easy!) It paints life as an unerring upward trajectory interrupted only by occasional blips, which you shall quickly overcome by virtue of your sheer YOU-ness. Just keep your legs pumping, avoid the “waiting place,” and you’ll literally reshape alpine topography with your bare hands. This is not a book that takes struggle very seriously. Over and over again, Oh the Places simply reasserts its optimism. It insists that bright-eyed enthusiasm will fuel its reader through any lurches in life. But that seems … well, naïve. Your thousand-watt smile isn’t going to power you through graduation dinner with your aunts and uncles, much less a lifetime of hang-ups and bang-ups. You need something grittier and truer, something more sustaining. This book claims struggle as a central theme. As one early stanza warns: “I learned there are troubles/ of more than one kind./ Some come from ahead/ and some come from behind.” Throughout, Solla Sollew tackles the deep human desire for easy triumph and premature happy endings—the very same desire uncritically indulged by Oh the Places. Solla Sollew goes boldly where Oh the Places is afraid to venture: toward an embrace of struggle. Life’s troubles are not brief interruptions, unexpected technical delays, or bursts of static on the radio. They are inescapable—and our response to them shapes the people we become. Oh the Places suggests that we are all perfect human cannonballs of destiny, soaring along our trajectories towards pre-appointed glory. But Solla Sollew understands that no utopia awaits. The message isn’t despairing—it’s real, and it’s beautiful. It’s a lesson as powerful and memorable as How the Grinch Stole Christmas’s yuletide warmth or The Cat in the Hat’s timeless warnings about feline mischief. Am I being too harsh on Oh the Places? No doubt. It is the final book written by one of my favorite authors. Its sparse elegance and undeniable sweetness make it a sentimental favorite. But when the man wrote that book in 1990, he could never have anticipated the grim social, political, and economic realities facing the young person today. It’s 20th century optimism misses the mark of 21st century life.